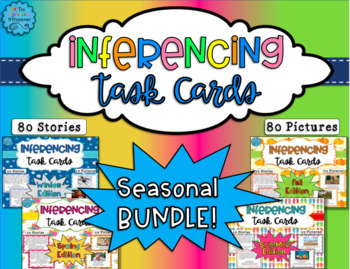 Inferencing Task Cards: Seasonal BUNDLE! 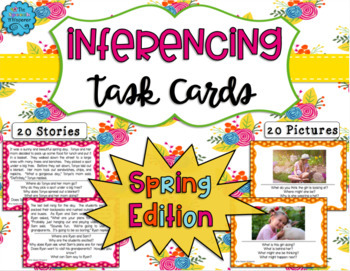 Save 25% (the equivalent of one FREE product) when you purchase this BUNDLE of inferencing task cards! Need some fun ways to work on inferencing with a a seasonal theme? Want something that will last you the WHOLE YEAR? 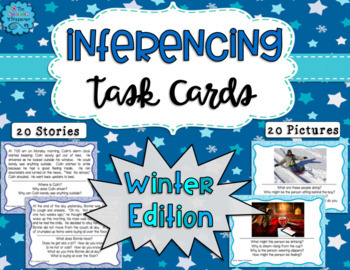 Then check out this bundled inferencing task cards packet! 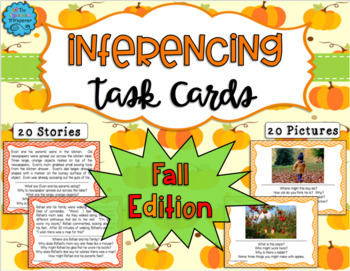 Each individual product contains 20 task cards with short stories and 20 task cards with pictures for inferencing, 1 visual support to teach inferencing, and 2 graphic organizers to use with each task card. That's a TOTAL OF 160 task cards! Each individual task card has specific questions relating to the story that target inferencing in some capacity. Use the picture cards for lower level learners and the paragraphs for higher level learners. Additionally, each set (paragraphs, pictures) comes 3 different ways: 4 per page with a colored background, 4 per page with a B&W background, and 1 per page to make it easier to use on a computer or tablet. Please remember to leave feedback to earn TPT credits! I always love to hear from you!